General Description: The Mehlville point type is a large triangular point which has basal notches and a short rectangular stem which tends to contract slightly. The blade is broad and triangular in outline usually having convex to recurved blade edges. The shoulders are deeply barbed. The barbs are squared, rounded or pointed and on some specimens droop inward. The basal notches are V-shaped. The Mehlville's primary use location was West-Central Illinois and the northeastern part of Missouri. The major area of distribution is near St. Louis and the mouth of the Missouri River and generally around 100 miles from that point. 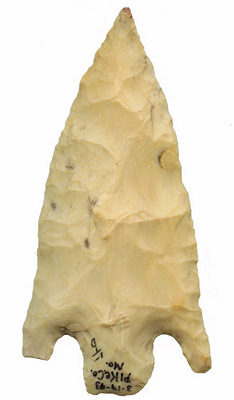 It has been reported that some Mehlville point may be found in northern Arkansas. The Mehlville size ranges from 60 to 140 mm with the average size being 90 mm. The typical material used in manufacture was Mozartkite and Kaolin chert or other white cherts. Perino suggests that the Mehlville as been often referred to as the Smith type but the Mehlville has a different shape from the Smith, being triangular, which the Smith point has parallel sides. The type was named by Gregory Perino from a point type found in a cache of eight points near Mehlville, Missouri in 1970 by David Hoefelmann in a road grading operation.